Most kids love to chat with other kids…and that’s certainly no different for children who “talk” with touchscreens! Camp Communicate is an innovative retreat designed specifically for non-verbal children who use computerized devices, known as augmentative communication, to communicate. Camp Communicate offers these children a unique opportunity to spend time with other augmentative communicators in an accessible summer camp environment. During their stay they will learn new skills, meet new friends and become more comfortable and confident in their communication abilities. Each camper attends Camp Communicate along with a parent/caregiver. Parents will have the opportunity to attend workshops and share information and strategies in a supportive environment. Learning opportunities for parents will support more effective augmentative communication device use at home and will foster more proficient use in school. Camp Communicate draws upon the strengths of Pine Tree Society’s Pine Tree Camp and Communication Pathways. The program takes place at Pine Tree Camp’s fully accessible 285-acre facility with staff and volunteers experienced in accessible recreation. Program curriculum and activities are developed and led by Communication Pathways staff, all highly qualified Speech Language Pathologists with an expertise in augmentative communication and assistive technology. I am interested in this camp for the summer of 2017! When is registration ? Can u bring the whole family, even pets? Thanks for reaching out to us! Your question has been forwarded to the Director of the Communications Pathways program. She has your email address so she can get in touch with you about the possibility of attending Camp Communicate in 2017. I am looking for info for summer 2017. Do you also work on vocalizing along with AAC? Hi, Thanks for getting in touch with us! The Director of Communications Pathways (she is also in charge of Camp Communicate) will email you directly in the next few days, to answer any of your questions. I am interested in learning about summer opportunities for this summer 2017. Thanks for getting in touch! 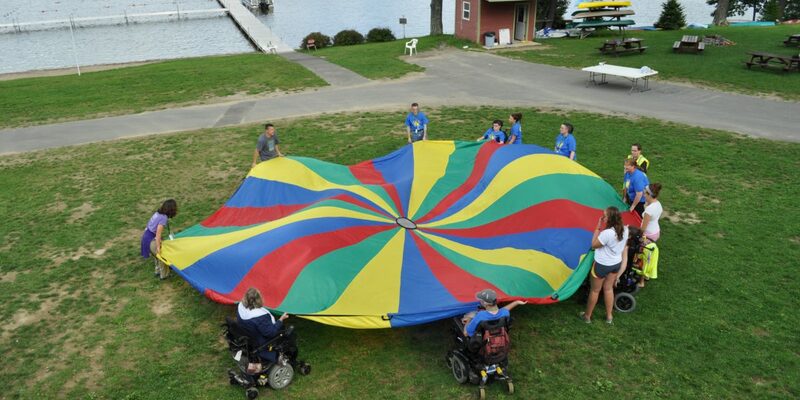 Are you specifically wondering about Camp Communicate (specific to communication devices) or Pine Tree Camp sessions, in general which serve children and adults with a wide variety of physical and developmental disabilities? Hi, I am interested in learning about Camp Communicate for my son and I this summer. Could someone please contact me with the dates and some additional information? Thanks for reaching out! The dates of Camp Communicate in 2017 are June 27 – July 1. Your email address has been given to the Director of Communications Pathways, so that she may reach out to you to answer your questions. My name is Heather Eigen. I am an administrator in the Andover Public Schools that has the privilege of overseeing the specialized programs PK through grade 8 (Autism and Developmental Delays). I am in the process of compiling a list of summer opportunities for the parents of our students. 1)	Is your camp experienced in supporting students with disabilities? If yes, can you please elaborate. 2)	Can you please describe your program? Academics? Special services? Recreational activities? 3)	Staffing to Student Ratio? 7)	Cost? Do you accept insurance? Thank you very much for your help and appreciate your time. Thanks for contacting us. Your questions have been forwarded to the Director of Pine Tree Camp. She will reach out to you via email soon. Are children with behavior problem able to attend? Thanks for reaching out to us. We need to consider each case individually. We want to be sure the individual and other campers will be safe. Can you please email Linda Bonnar at lbonnar@pinetreesociety.org? She would like to talk to you. Are there still openings for camp communicate? What are the day hours, price and my other information you can share. Thanks for reaching out. Your question and email address has been provided to the Program Director, Linda Bonnar. Hi, I’m an SLP and AAC Specialist in CT interested in volunteering at Camp Communicate. Can you please send me info about volunteer opportunities? Thanks for getting in touch with us. Someone will be in touch with you to discuss your interest in volunteering. Hi there. We are located in Rome, Maine. Camp Communicate is full for the 2017 session but we are keeping a waiting list in case there are cancellations. Send an inquiry to ptcamp@pinetreesociety.org if you want to discuss that possibility. I’d like the dates for Camp Communicate 2018 & other details. Thanks for reaching out. We haven’t set a date for 2018 yet. We will be in touch when we do.